It’s not hard to find lichens, you simply have to look where other forms of life find the conditions too harsh. Sheer cliff walls, the surface of large boulders, tree trunks, the branches of living and dead trees, and the shaded acidic soils under pines, are all places where lichens thrive. They have even been found on the shells of living tortoises and on exoskeletons of insects. Lichens are able to grow in these places because they are a combination of a fungus and a photosynthetic partner. The fungus gives the lichen its overall shape and structure and produces pigments that shield its partner from ultraviolet light. These pigments are responsible for the wide variety of colors found in lichens. The fungus also has fine but tough threads that securely attach the lichen to the surface it’s growing on. The fungus also secretes acids that break down materials into nutrients for the lichen. These acids are so strong that they break down rock into minerals that are used by the lichen. The photosynthetic part of the lichen is usually an algae, but in some cases it is a type of photosynthetic bacteria known as cyanobacteria. The algae or cyanobacteria (the photosynthetic partners) produce the food for the lichen. 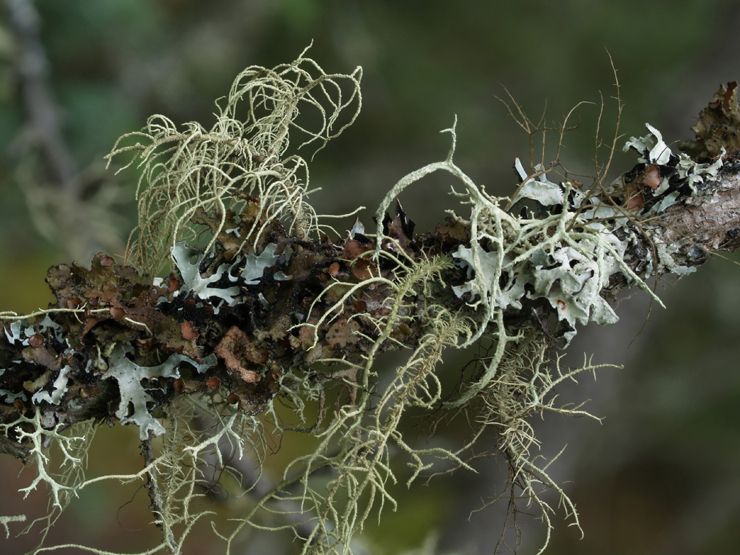 Since one part of the lichen makes food by photosynthesis and the other is good at extracting nutrients, together they make a potent combination. Due to this potent combination, lichens can thrive on brances of dead trees and other unlikely places. This type of close association between two different species is known as a symbiotic relationship. Most biologists believe that both the fungus and its partner benefit from this relationship. The fungus gets food that the algae or cyanobacteria make, while the algae or cyanobacteria get a protective place to live and nutrients that the fungus extracts from its environment. Recently, biologists have discovered lichens composed of a fungus and both an algae and a cyanobacteria. A close association between two species seems unusual, but the existence of lichens composed of three different species opens up a whole new world of interactions. Not all biologists, however, think that all the partners in these relationships benefit equally. Some propose that only the fungus benefits and that the photosynthetic partner is a captive of the fungus. Lichenologist Trevor Goward has described lichens as Afungi that have discovered agriculture. @ Many of the fungal partners appear to be unable to exist on their own, while the algae and cyanobacteria are usually able to survive by themselves. It may be that in some cases only the fungus benefits and in other cases both the fungus and its photosynthetic partner benefit. Whatever the nature of the relationship, it is apparent that lichens can exist in places that neither of the partners can live in on their own. They are found in some of the hottest and driest places on this planet and also in some of the coldest. They are found in Antarctica where no plants or fungus exist on their own and where few bacteria can survive. These lichens simply shut down in the extreme cold of winter, but are able to start functioning again when the temperatures start to rise. Lichens are known to photosynthesize at temperatures as low as -20 Celsius (about 0 Fahrenheit). This ability to photosynthesize at temperatures well below freezing gives lichens a huge advantage over plants in cold climates. It also allows those in areas like the Boundary Waters to begin producing food in late winter when there is still ice on the lakes and deep snow in the woods. At the other end of the growing season, lichens also extend the period for photosynthesis well into the winter. They can also grow on a wide variety of surfaces, including man-made ones. Lichens are found on asphalt shingles, brick buildings, cement bridges and even on stained glass. A study in France showed that 16 species of lichen grew on one large old stained glass church window. The growth of lichens on stained glass is a problem on many of the old churches in Europe. 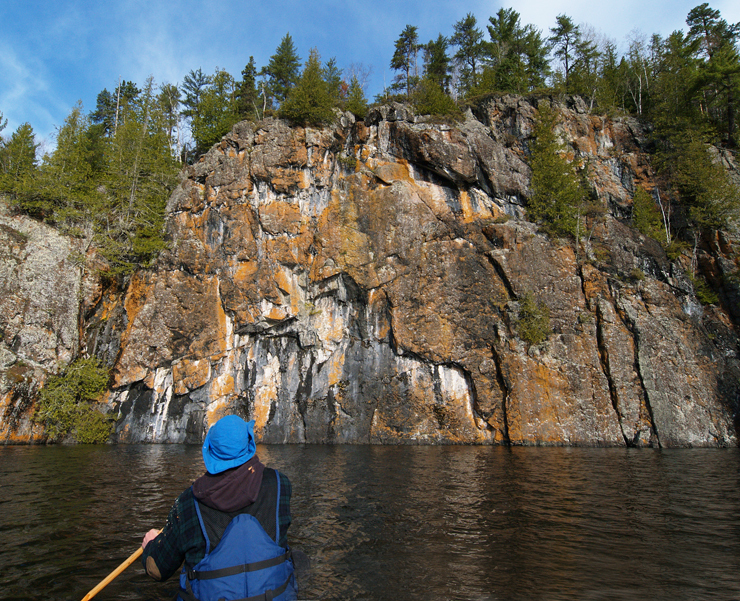 Lichens are also found in specialized natural habitats in the Boundary Waters. Those that are nitrogen-loving are found on cliff faces and boulders that regularly get splattered with bird droppings. Below bird nests and bird perches are located unusual lichens that can utilize the nutrients found in these droppings. Vertical cliffs have many different kinds of lichens because, depending on their pitch and orientation, they have different habitats. Those lichens that require more water can be found on north-facing cliffs or areas that regularly get run-off from above. Species that can survive with very little moisture are usually found on unshaded south-facing cliffs. Only those places where rock has recently broken off, or areas of exceptional dryness, are totally devoid of lichens. Areas that have a combination of adequate light and some moisture trickling down from above are usually the richest in lichen diversity and growth. This cliff on Ottertrack Lake is covered with a mosaic of colourful lichens. The type of rock is also an important factor in what species of lichen grow. The cliffs on Quetico Park’s Emerald Lake are high in lime and have a very different variety of lichens than the siltstone cliffs on Knife Lake or the granite cliffs on Quetico Lake. Some of Quetico’s cliffs have striking orange lichens, usually from the genus Caloplaca or Xanthoria, that brighten up the lake even on the dullest of days. These bright, eye-catching lichens can be found on the Man Chain and on the high cliffs of Ottertrack Lake. The crusty lichens that grow on cliffs, bedrock and boulders, can be found in a variety of colors. Shades of grey seem to dominate, but brown, black, white, orange, red, yellow and even blue ones can also be found. The only place I remember seeing blue lichens was on sloping bedrock at Kings Point on Basswood Lake. The very large, scaly lichens that are commonly seen on lakeside boulders are known as “tripe desroche” or rock tripe. This lichen, like many others, can withstand long periods of hot and dry conditions. It commonly becomes dry and brittle during July and August. It then looks like large, black, lifeless, scales on the rock. It survives these dry periods and quickly revives with the first rain. It still looks like large grey or black scabs, but is now softer to the touch. This unappealing lichen can be boiled and eaten as an emergency source of food. Survivors of airplane crashes and others who have run out of food have survived on rock tripe. 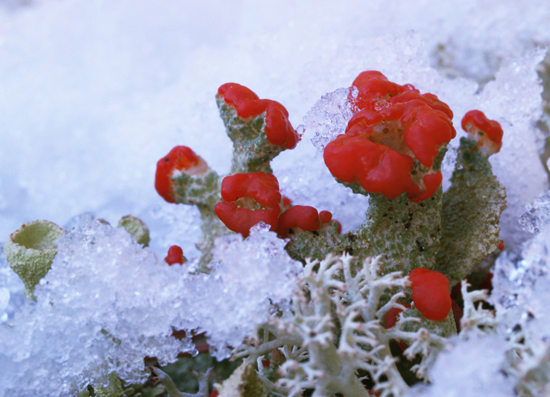 The Franklin Expedition in the 1820’s subsisted for 11 days in the Canadian Arctic eating these lichens. In addition to the crusty lichens that primarily grow on rock, there are also a wide variety of small, shrub-like lichens that grow on the ground. Some of these, known as reindeer lichens, are ash-grey in color and stand 2 to 5 inches high. They are commonly found growing in the acidic soils under black spruce and jack pine. These lichens, also known as caribou moss, are the primary source of food for caribou in the winter. Caribou use their large hooves to dig through the snow to get to the lichens. They leave large circular depressions, known as “craters”, when they are feeding on lichens in the winter. The word caribou comes from a Micmac Indian word that means “one who digs”. When woodland caribou occupied the Boundary Waters area they undoubtedly relied on reindeer lichens, which are fairly common in this area, for a major part of their winter diet. These caribou, who lived here just sixty years ago, were not the only large mammals to feed on lichens. Moose also eat reindeer lichens, but not nearly to the extent that caribou do. White-tail deer also eat lichens but, like moose, apparently in relatively small amounts. The exception can be in the winter when the snow is deep and food hard to find. Deer have small hooves and, unlike caribou, are not adept at digging through snow to get at plants underneath. 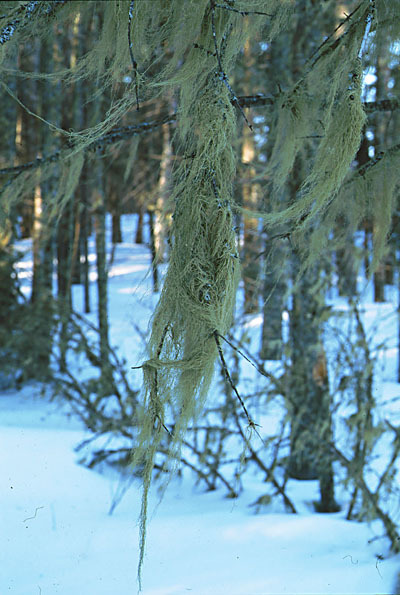 Some lichens, such as Old Man’s Beard, hang down from tree branches. This hair-like lichen can be well over a foot long and is commonly found on trees that are have been killed by spruce budworm. Old Man's Beard Lichen hanging from a branch of a dead spruce tree. Since it hangs down from branches, it is accessible even when snow is deep. Deeper snow can even make some available that the deer couldn’t reach when there was little or no snow. There is often a browse line visible, with Old Man’s Beard found only above where the deer can reach. Although important as a survival food, Old Man’s Beard is evidently not heavily utilized when other foods are available. Years ago I was told that Old Man’s Beard made a tasty snack when walking in the bush. I found that it has a pleasant but bland taste that changed to bitter if chewed very long. Many lichens are reported to have a bitter taste, possibly because the fungus produces toxic chemicals to keep insects and animals from eating them. Lichens are found on the same cliffs where pictographs are located and in many sites they have grown over the paintings. The location of pictographs was undoubtedly influenced by the presence or absence of lichen growth. Places that had overhangs that reduced the amount of moisture, and therefore the amount of lichen growth, were ideal locations for placing paintings. If conditions remained the same, pictographs placed in these locations should still have very little lichen growth and still be visible today. However, cliffs also change with time and ideal locations in the past may now have thick lichen growth that totally obscures paintings underneath. Some species of lichens grow so slowly that their progress in covering a pictograph has been used to try and date pictographs. In some places in North America, lichen was scraped away to leave an image behind. These images, known as lichenoglyphs or lichenographs obviously have a limited life span unless they are periodically renewed. They have been found on Lake Superior and Lake of the Woods, but nowhere in the Boundary Waters to my knowledge. Although lichens are extremely hardy, they don’t stand up very well to air pollution. They obtain a lot of their moisture from rain and consequently also take up many of the pollutants that are dissolved in the rain water. For this reason, lichens were among the most radioactive organisms tested after the Chernoble nuclear disaster. Lichen diversity drops dramatically when air pollution increases. Many species that were common in urban areas are now difficult to locate. Although much is known about many of the common lichen species, some of the lichens in our region are unknown and unnamed. Recent studies in forests in the Pacific Northwest found many new species in the canopies of old-growth trees. Undoubtedly new species also exist in the canopies of the old-growth red and white pines in our region also. Lichens are superb examples of how organisms that cooperate can out-compete other organisms. Lichens are remarkable, they photosynthesis like a plant and at the same time they decompose like a fungus. They utilize their dual natures to survive in places where other organisms can’t. They undoubtedly were among the first organisms to grow in our area after the glacier retreated through here about 11,000 years ago. They helped to set the stage for the rich and diverse ecosystems that followed. These tough but fragile pioneer organisms continue to thrive in the Boundary Waters. There is hardly a cliff, large boulder, patch of ground more than a few metres across, or trunk of a mature tree, that doesn’t have lichens growing on it. They are so common that they become part of the background and go unnoticed. This summer go out of your way to paddle slowly alongside a cliff and carefully check out the variety of lichens growing on the rock. Run your hands over the cliff face and feel the variety of shapes and textures of the lichens. Cliffs are vertical mosaics with almost as many kinds of lichens as the number of plants you’d find on a similar-sized plot of ground. Lichens of the North Woods, a recent book by Joe Walewski, is an excellent source of information about identifying lichens in Quetico Park and other northern forests. The next time you are having lunch on the rocky shore of a lake, take a good look at the lichens that you have been walking and sitting on. A small hand magnifier, like those that geologists use, will give a clearer view of these fascinating organisms. The colors and shapes are astounding. You can spend hours exploring a habitat just a few yards wide. Really enjoyed your lichen photos. I have seen most of these in Newfoundland over the years.I really enjoyed reading your article on lichens. I am a amateur naturalist and photographer and have been studying and photographing the lichens around my province of Newfoundland for the past few years.